Fans: are you ready for another preview of what’s to come from Tech N9ne’s Something Else? Look no further than the Strange Music and Monster Energy Fan Challenge. Not only will you get a free download of a song from Tech N9ne’s Something Else, you’ll also enter for a chance to win a fly away trip for two to the kickoff show of the Something Else Tour in Kansas City, MO. When you get a physical copy of the 2013 Independent Powerhouse Sampler at one of the tour stops for the Independent Powerhouse Tour, open it up and look for the promo code inside to enter in the Monster page here. When you unlock the page, you get to listen to a BRAND NEW Tech N9ne track from Something Else, plus you get to watch a special video announcement from Tech N9ne regarding the brand new contest to see his kickoff show for the Something Else Tour. For Technicians across the nation, it doesn’t get any sweeter than this! 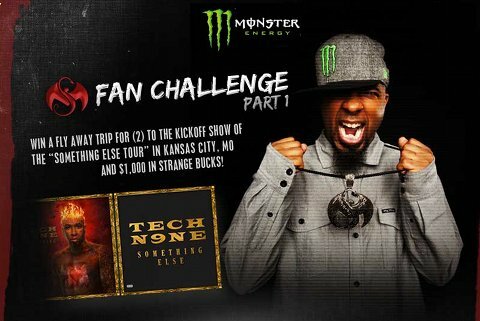 Click here to be directed to the Monster Energy and Strange Music Fan Challenge!